Good day/evening (depending on your time-zone) from Mazda Raceway Laguna Seca, where I (Steve) am on site to provide you with coverage of the Mazda Road To Indy finale. Each of the three series had fifty minutes of testing time available today. Check below for those reports. Normally you’d have seen series-by-series previews from us by-now, but we wanted to spend today chatting with drivers, engineers and series officials to see if we were forgetting anything. Expect to see some very in-depth previews hit your in-box overnight. This is my first visit to Mazda Raceway Laguna Seca, and to say I’m excited to be here would be an understatement. I’ll have more on the circuit tomorrow, but my first impression is that television doesn’t begin to do the elevation changes justice. I arrived in San Francisco around 10am yesterday and took the time to drive down Highway 1 from Half-Moon Bay to Monterey. All I have to say is… WOW! Can I say that louder… WOW! It would really take a number of days to explore the sixty or so miles of coastline properly, but I was able to take the time to stop and check out a number of the spectacular vistas. 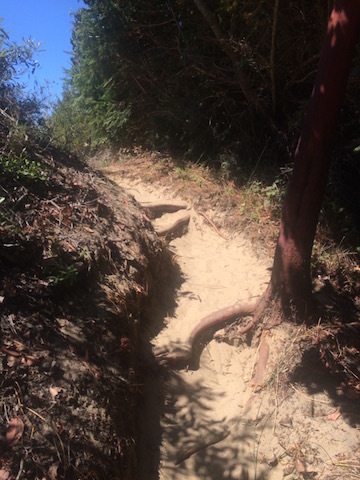 Why the hike? 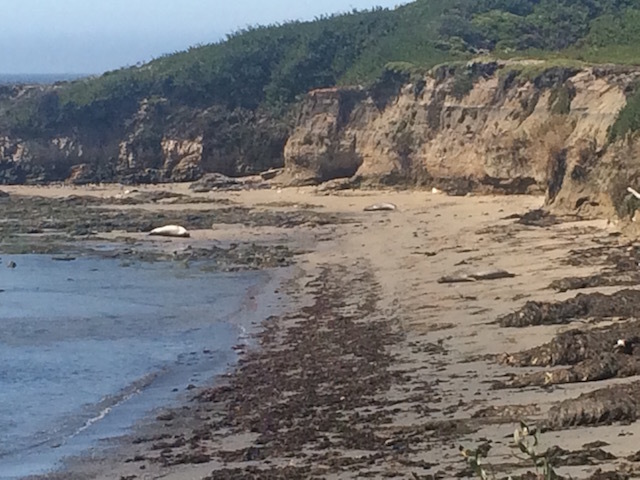 The beaches of Año Nuevo are home to a large colony of Elephant Seals. I was told that this week is likely one of the worst weeks to view the large ocean going mammals. There were only 20-25 seals present, but the strenuous trudge through the deep stand was still worth it to watch a few pairs of adolescent males play fight in the surf. 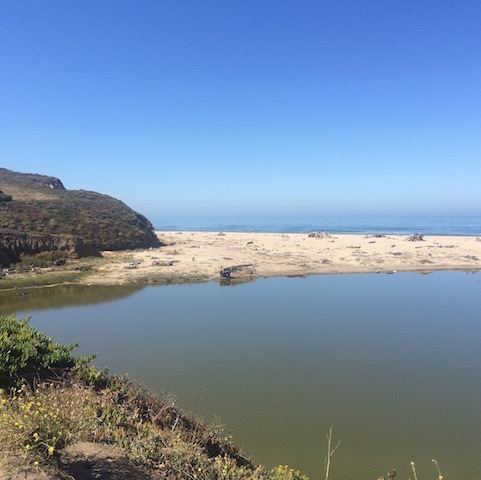 I spent close to an hour sitting on a bench enjoying the the sights and sounds (Elephant seals make very unique sounds that sounds a lot like an early 80’s VW diesel engine on a freezing cold morning). Apparently the best time to visit is in late December and January when the mature males fight over harems of females. During that time you must be accompanied by a docent on a tour. The docents are still present during the “down” time and are super friendly and happy to share information about the seals. The rest of the drive included many more spectacular vistas, and surprisingly many miles through agricultural land. I was not aware of this part of California was known for farming but apparently the foggy mornings and sunny but cool afternoons are perfect to grow lettuce, artichokes, strawberries, avocados, cabbage and brussels sprouts (which you can smell while driving by). I arrived at my hotel in Monterey just after 7pm and was quite tired so I hit up the local grocery store for a quick dinner, so no exciting tales of food. A group of us are headed to Cannery Row in Monterrey tonight, so I will make sure to have a full report. An interesting note about the weather. The weather in Monterey seems perfect to me. I came from Indiana, where it’s been 90F plus with high humidity. At the track it’s around 80F with almost no humidity, but the “heat” is all the locals can talk about. I guess it very rarely gets this warm here. The forecast calls for the same “heat” tomorrow before it cools down for the weekend. It’s not just championships, pride and bragging rights on the line this weekend at Mazda Raceway Laguna Seca. Mazda Motorsports will be dolng out over $2.3 million in season ending awards, including three advancement scholarships at the season ending banquet held in Monterey on Monday night. Indy Lights presented by Cooper Tire championship contenders Jack Harvey, Spencer Pigot, Ed Jones or RC Enerson are chasing a $1 million dollar advancement that assures the winner three races in the Verizon IndyCar Series in 2016, including a chance to qualifying for the 100th running of the Indianapolis 500. Making the move up the ladder to Indy Lights courtesy of a Mazda Motorsports advancement scholarship will Santiago Urrutia or Neil Alberico, the two drivers with a chance to take home the Pro Mazda presented by Cooper Tire title. 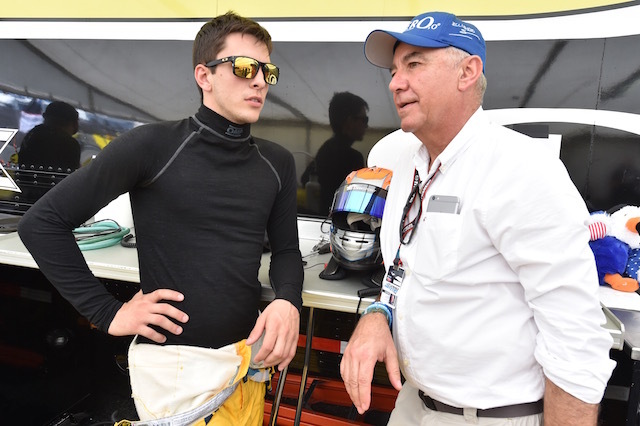 A fully funded Pro Mazda ride is on the line for Nico Jamin and Jake Eidson, the two drivers in contention for the Cooper Tires USF2000 powered by Mazda championship. If you are already missing open wheel racing, don’t fret. RoadToIndy.TV will have live streaming of all six Mazda Road To Indy races from Mazda Raceway Laguna Seca this weekend. or you can watch on the RoadToIndy.TV app – available via Android or Apple iOS. The Indy Lights finale will also air on NBC Sports Network on September 24 at 11pm (eastern). The No. 21 Mazda powered Dallara that Heamin Choi will be driving for Schmidt Peterson Motorsports with Curb-Agajanian is being leased by the team for the weekend. The chassis was Dallara’s test car and has previously been driven by Matthew Brabham at St. Petersburg and Long Beach. The No. 5 and No. 7 Schmidt Peterson Motorsports IndyCar teams are providing the crew for Choi. You will find more on Choi as a driver in tomorrow’s Indy Lights preview. Making a return to ArmsUp Motorsports for the USF2000 twin-bill finale will be Peter Portante. The 19 year-old finished sixth in the 2014 USF2000 championship while driving for the Gregg Borland owned, Sheboygan Falls, Wisconsin based team. Portante has been contesting the Battery Tender Mazda MX-5 Cup presented by BFGoodrich championship this season and currently holds down fourth in the standings with one event remaining. The Plainville, Connecticut native does have previous experience at Mazda Raceway Laguna Seca, contesting two MX-5 cup rounds this year and two USF2000 rounds in 2013. 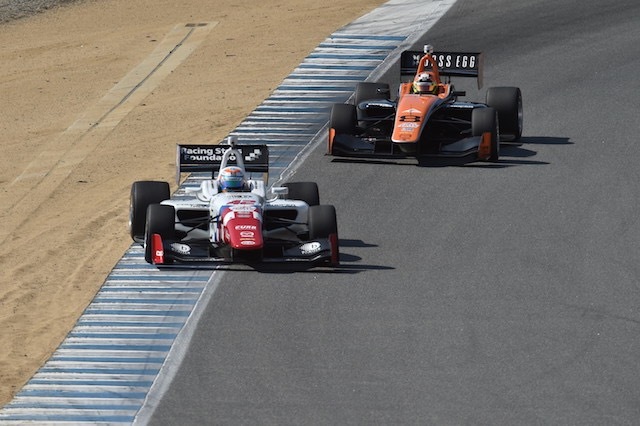 The 13 entries for the Indy Lights Grand Prix Presented by Cooper Tires and Powered by Mazda spent 50 minutes turning laps on the hilly Mazda Raceway Laguna Seca road course. The top five in the morning session were: Kyle Kaiser, Max Chilton, Sean Rayhall, Ed Jones and Felix Serralles. Of note in the morning session was the placement of the five Schmidt Peterson Motorsports with Curb-Agajanian drivers in eighth, ninth, 11th, 12th and 13th positions. TSO was able to confirm that the team was running on full tanks and also with carry-over used tires. The lone “on the hook” moment of the six Mazda Road To Indy sessions came when the No. 5 Juan Piedrahita had an off in the Corkscrew. That ended the second Indy Lights session five minutes early with Kyle Kaiser, Spencer Pigot, Sean Rayhall, Ed Jones, and RC Enerson as the top five. 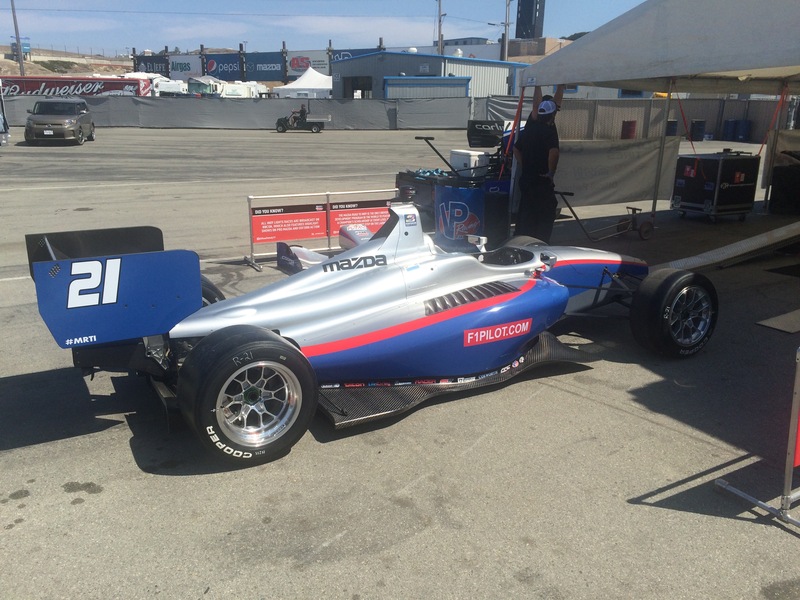 The first of two practice sessions for the 19 drivers entered in the Allied Building Products Pro Mazda Grand Prix of Monterey began promptly at 9:20am. The top 10 in the morning session were: Santiago Urrutia, Neil Alberico, Jose Gutierrez, Weiron Tan, Pato O’Ward, Raoul Owens, Will Owen, Timothe Buret, Garett Grist, and Alessandro Latif. Even with the much hotter afternoon temperatures, lap times improved significantly during the second session. It’s pretty clear, that early on Team Pelfrey has found a good set-up for Mazda Raceway Laguna Seca. The top 10 in the morning session were: Pato O’Ward, Santiago Urrutia, Raoul Owens, Neil Alberico, Garett Grist, Weiron Tan, Jose Gutierrez, Will Owen, Dalton Kellett, and Kyle Connery. The combined timesheet for the day ended up as follows. The drivers of the Cooper Tires USF2000 powered by Mazda took part in two test sessions on the 2.238-mile, 11-turn Mazda Raceway Laguna Seca road course in preparation for this weekend’s Cooper Tires USF2000 Grand Prix Powered by Mazda finale. It’s not uncommon for USF2000 drivers to have to play the part of “dew-sweepers” as the first cars on track during an event, and that held true again this morning as the first session started promptly at 8am. The top 10 in the morning session were: Jake Eidson, Aaron Telitz, Nico Jamin, Nikita Lastochkin, Parker Thompson, Yufeng Luo, Luke Gabin, Ayla Agren, Anthony Martin, and Keyvan Andres Soori. The second session began under bright California sunshine at 1pm and with more rubber on the track, the times dropped significantly. The top 10 in the afternoon session were: Jamin, Telitz, Eidson, Thompson, Martin, Lastochkin, Rickards, Gabin, Portante and Soori. There were a couple of tow-ins during the two sessions, but no major incidents.